Voice Overs: The a cappella group SoVoSo provides the lively musical backdrop to a circus of local talent. TANDY BEAL ADMITS she's blessed with a "glandular optimism." As a dancer of international repute, Beal has leveraged that optimism into a well-received strand of her work she informally labels celebrations. But another strand, equally as compelling, has fueled the joyful carousing synonymous with Beal's performances. "There's been a whole other parallel line that's much more introspective work," says Beal. "It's dealt with the mystery of being on the planet and the wonder of being alive." Beal refers to productions like her Blake's Window as evidence of this, noting that such pieces revolve around "the astonishment that we're here at all." The response to this introspection, she says, is celebration because "what else are you going to do?" So it's hardly a surprise that Beal brings her Circus of Song back for a second year. Circus of Song is Beal's own Cirque du Soleil, though she doesn't think about the groundbreaking Canadian troupe when creating her shows. "I think what Cirque brought is a level of artistry and the fact that circus doesn't have to be cheesy. They elevated the beauty factor," says Beal. Like Cirque, Circus of Song uses music and melody as the anchor for the performances. Instead of the ethereal quality inherent in Cirque's atmospheric pieces, however, Beal turns to the rhythmic, upbeat artistry of SoVoSo, an a cappella group that grew out of Bobbie McFerrin's Voicestra. 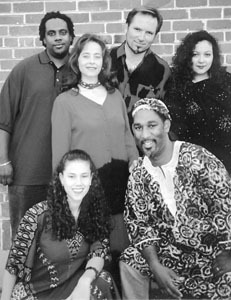 Beal is longtime friends with the founding members of SoVoSo, a relationship established when she worked with Voicestra in a performance that combined dance and song. Eventually the idea for Circus of Song germinated when Beal was director of the New Pickle Circus, a company she has since sold. Beal says Circus of Song is like a collection of short musical pieces. SoVoSo provide the musical backdrop as well as performing on their own. Accompanying them are an assortment of gymnasts, dancers, contortionists and jugglers--Beal's very own circus. And much of this circus is bred of local talent, culled and honed into performances that Beal simply describes as joyful. Returning from last year's production of Circus of Song is local rhythmic gymnast Saki Sakamoto, who has regularly delighted audiences with her spirited strength and flexibility. In one of the pieces, Saki will be joined by two other local performers in what Beal calls the Rag Doll Dance. Local juggler and stilt walker Rock Lerum will incorporate a unicycle and a volunteer act. Last year's volunteer portion of the show had members of the audience climbing onto the shoulders of one of the performers, shoes and all. Beal was predictably mum on how the audience would be involved this year. The mind-boggling contortionist Leslie Tipton and street gymnasts and hip-hop dancers the Vita Brothers bring additional talent to the show. Cameo appearances by the Watsonville High School singers and a chorus of younger singers, both directed by Paula Bliss, are evidence of yet another strand in Beal's manifesto: arts education. "Normally, people don't look at teens as productive and professionally focused," she says. "And normally, teens don't see disciplined, focused work as fun. These are the life principles that I'm interested in passing on. The high school students realize that they're going to get great fun and joy by practicing the discipline needed for the arts." With all these threads--celebration, dance, song, arts education, community involvement--the astonishing thing is that Beal can always be counted on to produce an inspirational and engaging romp. She calls it a "joy rush" and, glandular or not, who couldn't use more of that? Circus of Song is Friday (Feb. 22) at 7:30pm and Saturday (Feb. 23) at 2pm, at the Mello Center in Watsonville. Tickets are $12-$15, available by calling 763.4047.